Here are my predictions for the men's quarterfinals at the 2018 Australian Open. Last year I did not predict the quarterfinal rounds. This year I will also predict the women's quarterfinals. Rafael Nadal (ESP)  vs Marin Cilic (CRO) . This is the only quarterfinal match-up that was predicted to occur at the beginning of the tournament if results followed the seedings. In a tournament with lots of upsets it is significant that this match-up persisted. Nadal is playing excellent tennis and has only lost one set in four matches while Cilic has lost 2, one against Pablo Carreno Busta and another against Vasek Pospisil. The main problem for the hard-serving Croat is that he has played Nadal 6 times before and only won 1 match (and 3 sets out of 14 played) and half these matches occurred after he became a major champion himself. In fact, he has lost their 5 meetings in a row, including their one grand slam meeting, which was in Melbourne in 2011. That being said, Cilic does believe that he can beat Nadal and he has the game that could do it as well. I suspect he will win at least a set, and possibly even two but I don't see how he wins three. Mad Professah's pick: Nadal. Grigor Dimitrov (BUL)  vs Kyle Edmund (GBR) Jack Sock (USA) . 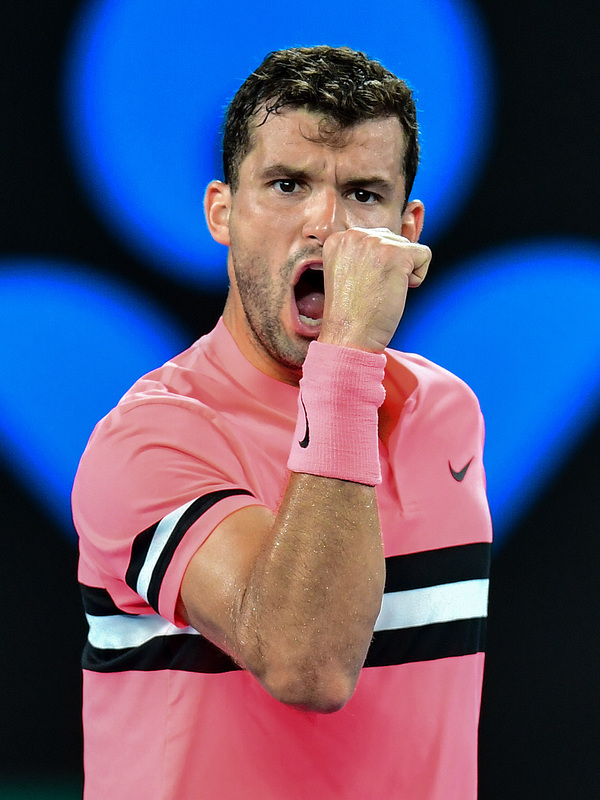 Dimitrov has not been playing his best tennis for most of this tournament, but Melbourne often does bring out his best stuff, as he proved in last year's epic 5-set semifinal against Nadal. This year he had to survive a surprisingly tough early test against young American Mackenzie McDonald in the second round by coming back to win 8-6 in the 5th after losing the 4th set 6-0! I wonder if anyone has ever won a major tournament after suffering a bagel set loss in an earlier round? Fortunately for Grigor, after coming through a much-hyped showdown with Australian "It" boy Nick Kyrgios in 4 tight sets, his game seems to be peaking. He faces Briton Kyle Edmund who is playing in his very first major quarterfinal, which should give the now experienced Top 5 stalwart a key edge in this important match. Can we hope that lightning will strike 2 years in a row and we will have another amazing Dimitrov-Nadal semifinal match? I think we will, and this time I hope for a different result. Mad Professah's pick: Dimitrov. Tennys Sandgren (USA) Dominic Thiem (AUT)  vs Hyeon Chung (KOR) Sascha Zverev (GER) . This is the most unlikely men's major quarterfinal in years. 21-year-old Chung was ranked #58 coming into the tournament and is the first player from South Korea, male or female, to reach a major quarterfinal. His opponent, World #97 Tennys Sandgren is the American male player to reach the Australian Open quarterfinals in over 20 years. They both had very impressive wins to reach this round. Sandgren eliminated Dominic Thiem in 5-sets while Chung was even more impressive by defeating 12-time major champion (6-time Australian Open champ) Novak Djokovic without losing a set. The las time these two played there were 20 ATP ranking points, this time there will be 720 points, which is more than the final of all regular ATP tournaments except at the Masters Series or Majors. One key factor here will be which player will fare better in their first high-stakes showdown. Here I give the edge to Chung because he won the 2017 NextGen championships last year. Mad Professah's pick: Chung. Roger Federer (SUI)  vs Tomas Berdych (CZE)  David Goffin (BEL) . This a rematch of last year's 3rd round match when it became clear that Federer's form after a 6-month gap was high enough that he might actually have a shot at winning the tournament. These two have played 25 times on tour and Federer has a commanding 19-6 lead, but that means Berdych has beaten Federer 6 times before so that he should be confident that he can do so again. Federer has looked fine all tournament long, and despite his draw looking much tougher than Nadal's at the beginning of the tournament, it has not turned out that way. If he gets past Berdych (which should happen), it is very difficult to see him not reaching the final, where perhaps another Fedal final awaits? I can't wait, eihter! Mad Professah's pick: Federer.